Happy October! This time of year always brings with it fall colors, cooler weather, hunting season, fun at the Yazoo County Fair, the annual Ag Days event, and many calls to our office about tours to see the Witch of Yazoo grave and Glenwood Cemetery. It’s an exciting time… but visitors are usually limited in ways they can tour Glenwood, which was voted in a 2012 poll on Huffington Post as the 2nd “Spookiest Cemetery in the US.” Tours must be scheduled in advance and are usually held with groups of 20 or more. This year, interest in the legend promises to be even more profound. On October 14 at 10:00 p.m., the Travel Channel’s series “Most Terrifying Places in America” will air an episode that details the legend. Be sure to mark your calendars to watch the premiere or set your DVR. This episode will be quite a treat for anyone interested in Yazoo’s legend of the Witch of Yazoo City. This year, we once again have great news for all you fans of the Witch of Yazoo and of America’s 2nd spookiest cemetery, Glenwood Cemetery in Yazoo City! 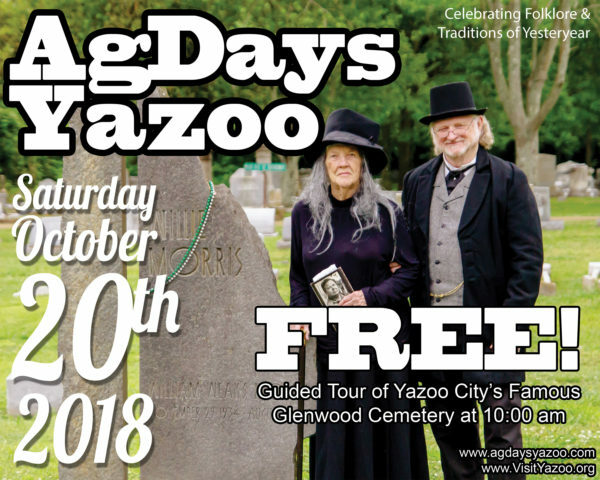 The 2018 Ag Days Yazoo event on October 20 is offering a FREE tour of Glenwood Cemetery guided by two costumed storytellers. Be sure to stop by the Ag Days event at the Triangle Cultural Center and then head to the cemetery at 10 am for the FREE TOUR. After the tour, be sure to head back to the Triangle to enjoy all the fun and live entertainment at Ag Days! Hear the stories of many buried in Glenwood and the unique people and history that helped make Yazoo so special. Your tour will end with the telling of the Legend of the Witch of Yazoo. The video below gives you a glimpse into the fun! The cemetery tour is about a half-mile walk through Glenwood. If you are unable to walk the terrain to take the full tour, you are welcome to wait near the grave of the Witch of Yazoo and hear her story. We hope to see you there! Antique Days is sponsored in part by the Yazoo County Convention & Visitors Bureau. When are the next cemetery tours?